This bundle covers all of the second grade standards for literature, informational texts, foundational skills, writing, speaking and listening, and language standards. These boards allow for easy differentiation for your students, as well as provides enrichment activities for your early finishers. 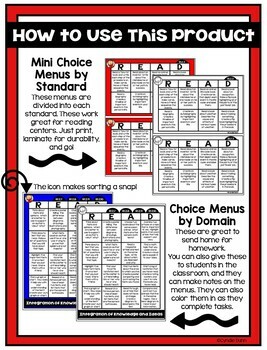 These choice boards cover all of the second grade informational text standards. These boards provide easy differentiation for your students, as well as provide enrichment activities for your early finishers. In this unit you will find 13 choice boards. These boards have 10 mini choice boards, one for each second grade literature standard and 3 choice boards sorted by the different domains. 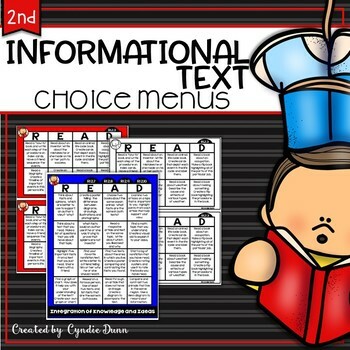 On each mini choice board, you will find 8 activities for your students to use with their independent informational texts. 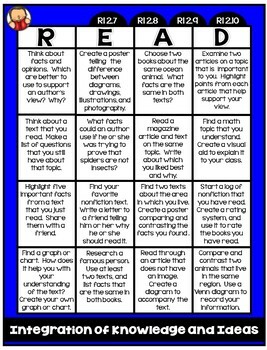 These activities work well to broaden students’ understanding of the Common Core Informational Text Standards for second grade. 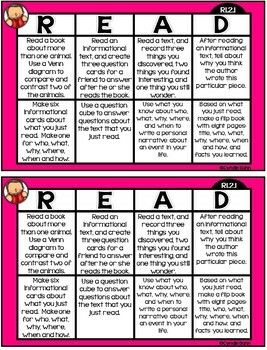 These choice boards are perfect for homework, early finishers, independent work time or reading centers. These choice boards come in both a full color format and a black and white format. These are great for the regular classroom, enrichment, GATE or accelerated classrooms.